We're having a retreat at the famous, notorius and exclusive Gregg's Plein Air Ranch in the remote mountains of Eastern Washington. Creeks, cliffs and cottonwoods. Draft horse models and barbecue. It's so beautiful your painting will paint itself! Gregg goes to Washington D.C. I've had the opportunity to visit Washington D.C. since I was a youngster. The first time I visited the National Gallery of Art I was 15. I learned I wanted to be a conservator but that never happened. This trip with my wife Betty, who was there on business, I had the good fortune to visit the frame conservator for the Lund Foundation at the National Portrait Gallery, Martin J. Kotler, who is also a plein air painter. I learned more than I knew there was to know about frames in the short hour or so that we visited. Now I look at frames as much as I do the paintings. Every trip I learn of another museum. I visited the National Gallery of Art where there was a great new exhibit of Gaugain's work and the The Dale Collection of Impressionists. I visited the National Portrait Gallery and discovered the archives of the Luce Foundation, with over 3000 pieces of art to view. I visited the Corcoran where I discovered the video installations of Grazia Toderi who believes we are light from the comets that made the earth 3 billion years ago and makes video art to let us see what she means. I visited the Rothko Chapel at the private Phillips Gallery and came away with a new mentor. From Rothko's work, I discovered how to emmancipate my paintings from being just a slice of reality and hope to pursue the possibilities. I've already completed one piece that is an homage to Rothko that works well. Both my wife Betty and I now see many Rothko's that need to be painted. It is peculiar that 'realists' emulate 'the masters' ad naseum but few profess to be followers of abstractionists. Perhaps I am wrong and have only been traveling in a particular circle of artists and will come to prove myself wrong. But I must say that abstractionists and conceptual artists such as James Turrell (who has an installation "The Black Box" at the Corcoran) and Grazia Torderi are my latest inspiration. Here's a quote from Toderi, “Orbite Rosse” (Red Orbits, 2009) is a double video projection created for the Venice Biennale. The projected light brings out a stratification of transparences and lights, of cities that are superimposed and continuously transform, and two broad ovals, celestial or terrestrial maps, colored planispheres or cosmograms, upon which luminous tracings dance, trajectories, “invisible cities,” imagined thinking of Italo Calvino and the large lithograph “Venetie MD” (Venice 1500) by Jacopo de’ Barbari, now in the Palazzo Ducale in Venice. “Projections” of light that penetrate our consciousness through the two mysterious “red orbits” of our eyes, which direct the images of our head-world"
Whether it was Rothko, Toderi or the Einstien Planetareum, I seemed to be pre-occupied with the tenet that we are all light. 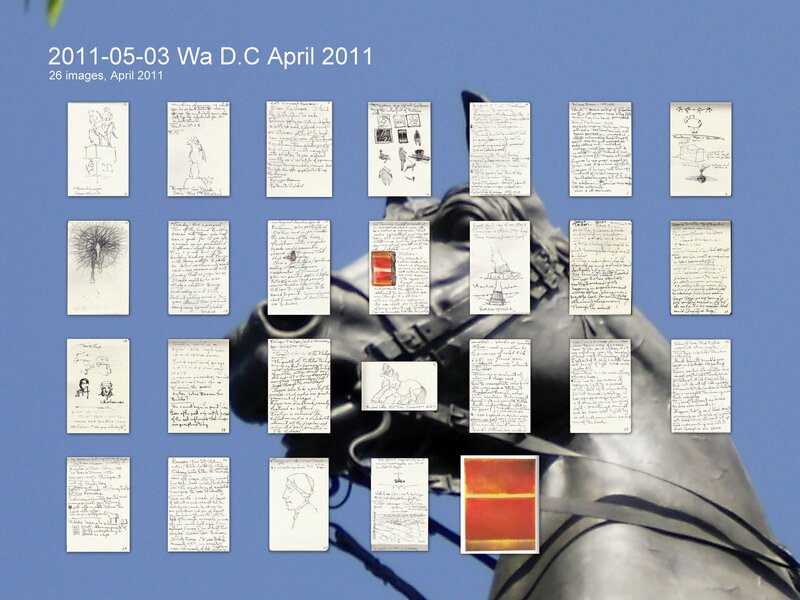 Another self appointed project was to document 'horses of Washington D.C.'. I photographed some 200 horses. Generals on horseback, Degas's sculptures, Renaissance paintings of Rubens etc. Where ever I saw a horse I took a snap. What became apparent is that up until recent history the horse was the most common companion of mankind. It points out the enormous change that has occured to our world. Mankind's relation to the horse is an emblem of how divorced from nature humanity has become. I included some of my notes. Click on the notes to expand the screen, then ctrl +, you might be able to see my marginally legible writing.